In gathering information for this article, I was surprised by the depth of the responses. As a result, this article will outline not only geospatial technologies available, but the importance of different solutions for interoperability, location, 3D urban models, technology designed for local responders, traffic jam data, field applications and much more. The offerings from some of the smaller providers round out the solutions from the bigger companies with some very insightful perspectives on the bigger picture of emergency response. Chris McIntosh, Emergency Management Industry Manager said that when disaster strikes, Esri’s Disaster Response Program (DRP) Disaster Relief is there to support responders around the clock, 24 x 7. “Request assistance from Esri experts, augment software, explore content, and monitor events online as part of our corporate citizenship. We’re there when responders need us most,” he said. According to Kalyn Sims, Vice President of Public Safety Products, Intergraph SG&I, Intergraph provides extensive solutions for public safety, security and emergency management. These include integrated capabilities for public safety dispatching, law enforcement records management, data reporting and analysis, physical security information management and field solutions, including mobile apps. 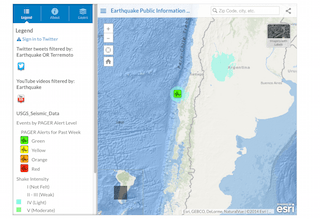 Also included are geospatial visualization, analysis and information management capabilities for emergency planning, preparedness and recovery. Intergraph states that the foundation for public safety, security and emergency management operations is a common operational picture (COP). By referencing data to a common spatial framework, a COP provides a comprehensive, up-to-the-minute view of the situation on the ground, fusing static mapping with real-time data feeds, often from multiple agencies and organizations. The COP’s spatial framework helps the operator understand situations more quickly by showing the locational context of an incident and providing links to supplementary information that can help determine whether action is required. It also enables spatial analysis techniques to be applied to real-time data to automate and streamline processes, saving vital time; for example, optimizing the locations of responders to enable shortest response times across a service area. In the news just this past week was a collaboration announcement between Intergraph and Esri to enhance geospatial capabilities for public safety and security agencies. Through this collaboration the companies will work together to align Intergraph’s Computer-Aided Dispatch system, I/CAD and Esri’s ArcGIS platform. TomTom, a provider of digital maps, navigation, real-time and historical traffic and weather content, provides these services to governments, enterprises, smartphone and automotive customers. 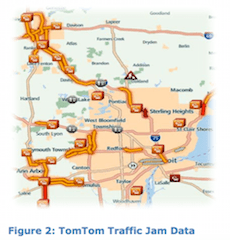 TomTom’s content is used by their partners who provide various visualization solutions implemented in a wide range of applications, including emergency management and response. TomTom develops, maintains and distributes advanced navigable map data for 127 countries throughout the world. They also provide real-time traffic information for 46 countries. Trimble offers a variety of modeling and analysis software that enables assessment and visualization of existing, planned, and changed environments, both built and natural, according to Rick Gosalvez, market manager, Trimble Local Government. 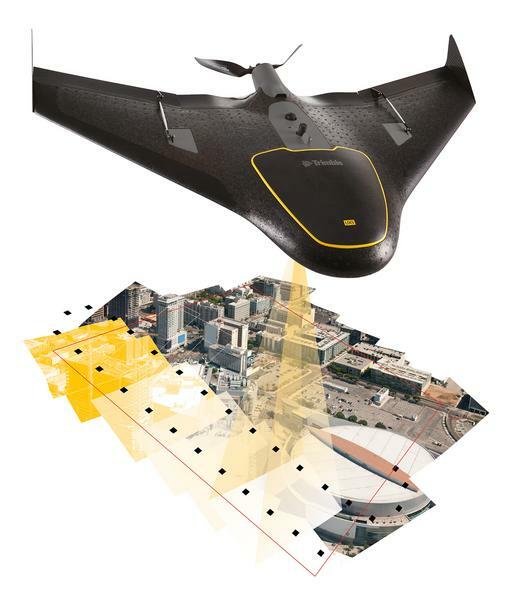 Some of Trimble’s visualization solutions include SketchUp for easy rendering and modeling, Inpho UASMaster for rapid aerial mapping, eCognition for rapid land classification and advanced change analysis, and Trimble Feedback for centralized review and visualization of crowdsourced data collected from the public. Seamless image capture and image analysis technology enables governments to collect a massive amount of data and mine it for useful information in a short amount of time. For example, eCognition consumes Trimble UX5 imagery and compares it to historical aerial images to conduct change analysis for emergency response planning. Pictometry, an EagleView Company, offers RapidAccess, an emergency response program offering immediate flights after an emergency or disaster. Within days, Pictometry can capture high-resolution aerial imagery post event, allowing users to view damage quickly in support of rescue, recovery and assessment efforts. It enables emergency teams to prioritize response with the help of up-to-date, high resolution imagery within days of the disaster, helping to get people back on track quickly. International Computer Works, Inc. (ICW) provides data conversion, software, training and support. Specifically, GeoNENA and GeoCAD911 provide direct application to the construction of the 911 database for the PSAP and a real time map display with address recommendations for use in dispatching for calls originating from a mobile device. CubeWerx is a geospatial products and services company offering rapid cloud-based hosting, processing and delivery of aerial imagery through Open APIs. Cubewerx OpenImageMap is an innovative, collaborative platform for deploying any volume of geospatial imagery and then delivering it seamlessly through multiple Open APIs, protected by a robust and security layer. 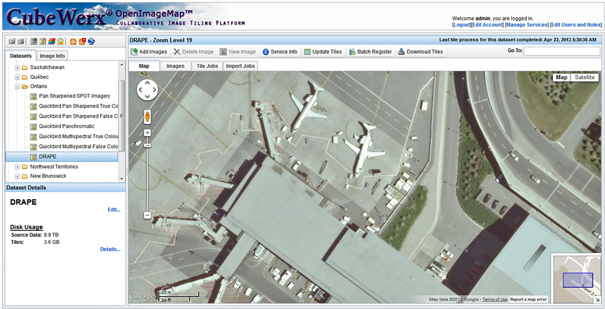 OpenImageMap is a collaborative image tiling platform that provides a cloud-hosted geospatial platform where multiple stake-holders can post aerial imagery, process it and serve it out as a combined map via standard APIs like Google Maps, Bing, OGC Services (WMS and WMTS) etc. Maptitude Generic GIS and mapping software is designed to model 3D environments within a GIS system at no additional cost. This makes it possible for even small communities to model their towns to be better prepared for emergency events. According to Jason Close, account manager, Latitude Geographics develops Geocortex software, that maximizes what organizations can attain with Esri’s ArcGIS platform. The services offered include: business analysis, custom development, migration and update services, project management, and hosting. Latitude Geographics’ flagship product is Geocortex Essentials, a framework architecture that enables REST-based configuration of server-sice services, easily deployed to out-of-the-box HTMLs and Silverlight viewers. Geocortex Active Operating Picture leverages data feeds from GeoEvent Extension for ArcGIS Server, which allows Emergency Operations Centers to receive alerts based on thresholds andbetter visualize mobile and stationary assets to support decision making during an event, incident or emergency. AOP’s design enables clear, multi-way communication with mobile accessibility, a common/clear map interface and tools for planning routes, sharing information and managing conversations. In an emergency, you need accurate data quickly. You don’t have time to hunt for it; you need to be able to access information to support critical decisions with only a few interactions. AOP makes interagency intelligence, crowdsourced social media feeds and associated map data accessible with a tap, click or targeted search. 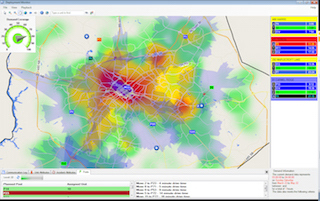 deployment of public safety assets using GIS technology. 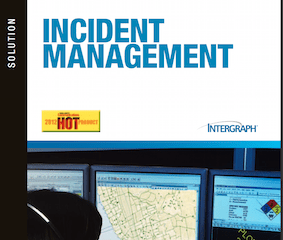 Over 200 organizations have already reduced response times to routine 9-1-1 incidents and improved compliance with organizational response goals through a better understanding of demand patterns and response capabilities. MARVLIS from BCS uses ArcGIS technology to forecast demand hotspots for an entire jurisdiction several times each hour. These automatically updated demand surfaces visualize changing patterns similar to the way meteorologists visualize and forecast weather patterns. Vehicle GPS locations are superimposed on the demand grid along with a dynamic vector service area to identify resource response capabilities along with the expected demand. Coming up to the plate, modern technologies, web GIS, the cloud, and the rise of apps have combined to bring powerful emergency response solutions into reach for most customers. Variations in implementations from completely hosted to “on premise” environments allow municipalities and communities to configure solutions that accurately meet their needs. The critical location and transportation information TomTom incorporates comes from mobile mapping vans, field survey, authoritative resources, probe data and sensors. These resources are fused through a transactional mapmaking engine, producing map changes that are distributed regularly. “This ensures our partners have access to the most recent map changes,” said Clay. The future of Emergency Response, according to Clay, is an improved ability to find the location of interest, coupled with improved drive-time efficiency derived from real-time views of current traffic conditions. This wealth of information has the capability to improve response decisions and increase the safety of first responders, according to Sims. It also has the possibility of overwhelming the PSAP. 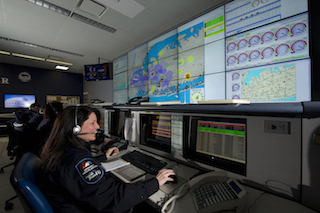 It is critical that dispatch systems manage this data so that it can be used efficiently by call-takers, dispatchers and first responders. Intergraph has developed software that will help integrate call control and call-taker functions in one environment and integrate voice and text calls with video and photo attachments for better situational awareness. Latitude Geographics states that stakeholder interoperability during incident response is an important goal. Achieving the use of standard alerting protocols and sensor web integration will play a large role in the years ahead. Programs such as UICDS, XchangeCore, MASAS-X (Canada), Oasis, Virtual USA and others are striving to provide necessary data to the responder community, with others expected to come on board in the future. What we will most likely see also are more collaborations between major geospatial organizations such as the one between Esri and Intergraph. According to Latitude, there is a growing need for better interoperability, mobile solutions, real-time data, social media integration, decision support and more. Isaacs said there is more demand for 3D content for Emergency Response solutions at the municipal and community levels as well as from providers of simulation software for this market. Resilient cities are those that will bounce back after a major disaster, according to Trimble’s Golsavez “To accomplish resiliency, governments will require properly planned infrastructure and programs to quickly assess impacts caused by major events. With UAS, mobile imaging and remote sensing technologies, governments will be able to quickly accomplish damage assessments in order to prioritize response efforts from a macro to micro scale. These technologies are available today and getting better quickly”. With technology that allows governments to easily capture conditions for their built and natural environments, governments will be in a position to be more resilient because they will be able to quickly compare before and after impacts of events and programs. More affordable Emergency Response solutions are predicted for the future for municipalities and communities. All respondents agree that trends like mobility and the cloud, platforms such as smartphones and tablets to empower field personnel to send and receive real-time information as part of an enterprise information system, all conspire to make Emergency Response solutions more accessible, timely and cost-effective. A significant portion of past spending in public safety has been based on grants that are now becoming less accessible. Organizations are increasingly being required to live within budgets. Preferred solutions will be those that can show a record of saving money and improving agency performance. Emergency management organizations face tremendous challenges meeting greater demands with fewer resources. Esri’s common operation platform supports the complex mission of preventing, protecting against, mitigating, responding to and recovering from threats and hazards. Communities will also be able to connect up with local, state, national and international agencies that support the mission. “The availability of data and the ability to quickly deliver that data in a focused way to operators on any device at any time will fundamentally change the way that we do business,” says Esri’s Chris McIntosh. This Maptitude map shows a color theme of wind and a scaled symbol theme of pressure based on historical hurricane track vector data. The map comes from Prof. Grant Thrall’s video, Part 2: Vector To Raster Grid Conversion: Calculation of Risk to Real Estate. Nuclear Power Plant Disasters in the U.S.? Maptitude maps featured in MapCruzin.com report. Maptitude includes the ability to model 3D environments within a GIS system at no additional cost: 3D mapping . This allows even small communities to model their towns to be better prepared for emergency situations. Intergraph has a long history of innovation in emergency response. “For example, we were the first vendor to offer a dispatch system with a fully integrated map and geographic database,” says Sims. Most geospatial companies that offer Emergency Response solutions work with other geospatial companies to enhance the strength of their services. Will Climate Change Driven Storms Result in Fukushima-Like Nuclear Power Plant Disasters in the U.S.? Maptitude maps are featured in a MapCruzin.com report on the likelihood that flooding at dozens of nuclear reactors could result in a Fukushima-like disaster in the U.S.
An example is, ICW, that offers an economical real time map display along with the tools with which to build the data used in the system running in a MapInfo Professional platform. 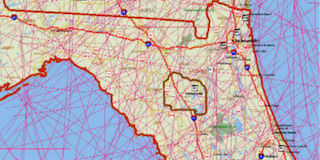 Regional data sharing does not have to be GIS brand dependent. On the contrary, data portability across platforms is the key. PLW Modelworks works with geospatial software companies such as ESRI and Autodesk to provide 3D urban model content optimized for their platforms. Combined with the advances and cost efficiencies in hardware, these optimizations allow more sophisticated simulation, tracking and real-time solutions to be offered to end-users. PLW can also utilize multiple input sources such as UAV or mobile mapping data to create and/or enhance their 3D urban models. 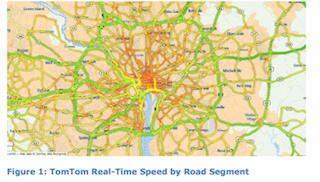 TomTom provides real-time map content that contains the most up-to-date depiction of the road network that is commercially available. The company also offers real time traffic content with average speeds and incident data available every minute. “With access to real-time maps and traffic content from TomTom, and the adoption of weather content, partner solutions can more accurately depict current transportation conditions, thus leading to more efficient Emergency Response,” says Clay. All those in Federal, state, county and local governments can benefit and save lives with an efficient Emergency Response template in place. Utilities, water, and environmental industries, homeland security, border control, public safety, security and emergency management organizations, fleet tracking, usage-based insurance, resource management, disaster relief, agriculture, mining, oil and gas, forestry who are dependent upon having access to the most recent information in rapidly changing scenarios are potential and real customers for advancements in Emergency Response. The future of Emergency Response is now; each day another opportunity arises to exercise the muscles of the new technologies and learn more about what will be needed for faster response, 24/7 coverage, data reporting and physical security, and how to address recovery and much more. With new 3D cities technologies in place, governments and agencies will also be able to build more resilient cities to withstand whatever emergencies befall them. This entry was posted on Friday, March 20th, 2015 at 3:46 pm. You can follow any responses to this entry through the RSS 2.0 feed. You can leave a response, or trackback from your own site.